Creating, adapting to, and exploiting change is inherently entrepreneurial. To survive and prosper under conditions of change, firms must develop the “dynamic capabilities” to create, extend, and modify the ways in which they operate. The capacity of an organization to create, extend, or modify its resource base is vital. Constance E. Helfat is the J. Brian Quinn Professor in Technology and Strategy at the Tuck School of Business at Dartmouth. Professor Helfat focuses her research on firm capabilities and knowledge, involving technological innovation and adaptation and change of firm capabilities over time. Sydney Finkelstein is the Steven Roth Professor of Management at the Tuck School of Business at Dartmouth. Will Mitchell is the J. Rex Fuqua Professor of International Management and Professor of Strategy at Duke University’s Fuqua School of Business. Margaret A. Peteraf is Professor of Strategic Management and Organization at the Tuck School of Business at Dartmouth. Harbir Singh is the William and Phyllis Mack Professor at the Wharton School, and the Co-Director of the Mack Center for Technological Innovation. David J. Teece is the Mitsubishi Bank Professor and Director of the Institute of Management, Innovation and Organization, Haas School of Business, University of California, Berkeley. Sidney G. Winter is the Deloitte and Touche Professor of Management at The Wharton School of the University of Pennsylvania. 2. Managers, Markets, and Dynamic Capabilities. 3. Dynamic Capabilities and Organizational Processes. 4. Executives, Dynamic Capabilities, and Strategic Change. 5. Relational Capabilities: Drivers and Implications. 7. Firm Growth and Dynamic Capabilities. 8. Dynamic Capabilities: Future Paths and Possibilities. Shows how firms must adapt to and exploit changes in their business environment in order to survive - ie they need 'dynamic capabilities'. 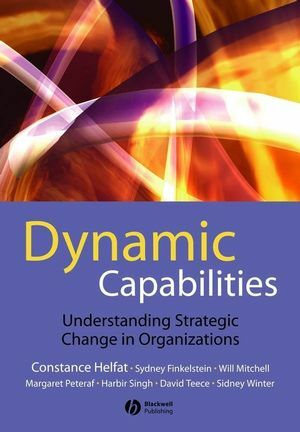 Provides a succinct yet comprehensive definition of dynamic capabilities. Offers case examples and empirical performance measures to test the concept of dynamic capability and demonstrate how it can be used. Examines the organizational and managerial processes that underly the successful evolution of capabilities. Develops the concept of 'dynamic managerial capabilities' to explore managers' capacity to create or extend their corporate resources.